First proposed in 1927 by Belgian physicist Georges Lemaitre as the “Hypothesis of the Primeval Atom,” the Big Bang Theory (mostly associated with the sitcom but popularized in movies since Disney’s Fantasia), remains the predominant explanation for the origin of how our universe got to be the way it is today – starting from a particle smaller than an atom that inflated some 13.8 billion years ago. It wasn’t always, though. For another forty years, despite the increasing evidence of an ever-expanding universe – galaxies drifting apart from each other, of varying ages and shapes; an abundance of light chemicals like hydrogen (about 75% of the universe) and helium; and the presence of cosmic microwaves, radiation that transitioned from visible light (some of the leftover radiation can be seen in the static given off by analog TV signals) – many astronomers clung to a steady-state model of the universe that gradually acquires matter. Astronomer Fred Hoyle even derisively referred to it once as the “Big Bang” and the name stuck. So was there anything before it? We don’t know. Then again, there also was no time or space before the Big Bang event either. Some evidence has been proposed that the universe has always existed, eons before the Big Bang set everything in its current state. The overwhelming majority of the universe is invisible, and sometimes the question is raised of whether the universe really is singular – or is it one of many? Nothing is sacred as the Large Hadron Collider (LHC) of the European Organization for Nuclear Research (CERN) is unleashed in Geneva this week. If the Large Hadron Collider finds miniature black holes, it may provide the evidence we need that parallel universes in fact do exist, and potentially that the Big Bang did not occur as cosmologists once envisioned. Already, the particle accelerator, currently the largest in the world, discovered the Higgs boson, known as the God Particle, which physicists suspect is what provides other particles with mass. If these holes give off a specific wavelength of energy, they could be further testimony for a rather controversial theory known as ‘rainbow gravity,’ proposing that our universe may reach an indefinite distance back in time, without a singular point of origin, and no cosmic inflation event necessary to start the beginning of matter as we know it. The theory is reconciled from Einstein’s theory of general relativity and suggests that varying wavelengths of light affect gravity in different ways. Were you to look backwards in time, the universe is more dense than in the present. Although it comes close to an extreme and infinite density, it never quite gets there. Consequently, its concept of the early universe is a bit different than the picture we have now. While this all sounds very surreal – Earth would scarcely feel the impact of rainbow gravity. 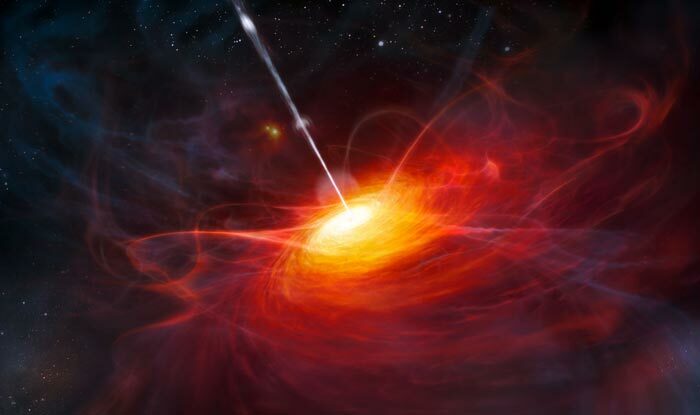 Black holes, however, would pick up on it considerably – increments that could be sizable and measurable, and easily within the range of the LHC. “We have calculated the energy at which we expect to detect these mini black holes in gravity’s rainbow [a new theory]. If we do detect mini black holes at this energy, then we will know that both gravity’s rainbow and extra dimensions are correct,” said CERN researcher Dr. Mir Faizal to Phys.org. This week will be the LHC’s second run, after being shut down for new installations at the beginning of 2013. It will be fully operational by Wednesday with its beams opening full circle. When the 27 km accelerator is active it will begin hammering together protons at a rate nearly twice the energy needed to discover Higgs boson. Rolf Heuer, Director General of CERN, hailed the switch-on as unprecedented, ‘a new era for physics’ that could shed some light on those not so visible forces in the universe: dark matter, dark energy and super-symmetry. “I want to see the first light in the dark universe. If that happens, then nature is kind to me,” said Heuer. Then there is that sci-fi fantasy that almost seems within reach of the LHC – a bridge between two worlds, or rather, two universes – a probability that another parallel dimension could bleed into our own. Do the physicists have an explanation for this yet? “Just as many parallel sheets of paper, which are two dimensional objects [breadth and length] can exist in a third dimension [height], parallel universes can also exist in higher dimensions,” added Dr Faizal. “Normally, when people think of the multiverse, they think of the many-worlds interpretation of quantum mechanics, where every possibility is actualised. This cannot be tested and so it is philosophy and not science. Since its two-year hibernation, the new and improved LHC has quite a few things to brag about before being fired up for its next run: newer, more powerful magnets, superior cryogenics (you read that right – the LHC is in fact the coldest place on Earth, with an epic cooling system that can keep noble gases like krypton in liquid form), higher voltage and even higher energy beams that mean an acceleration nearly twice what it made on its first run. Frances Saunders, president of the IOP, said, “This has been a massive effort by all the scientists and engineers at CERN to upgrade the LHC and its detectors and get it ready to operate at almost double the collision energies of the first run.